A-4F Gate Guard at Accomack Airport, Virginia. The next time you are heading south on US-13 on the DelMarVa Peninsula on your way to the air shows at Ocean City, Langley, Oceana or even Cherry Point, make a quick Pit Stop at the Accomack County Airport in Melfa, Virginia, a mile west of US Route 13, for a pleasant surprise; a special Cold War Warrior Gate Guard. Accomack Airport (KMFV) is a small county-owned public use airport located one mile west of the central business district of Melfa, Virginia, right off of US-13. Top to bottom: Visitors at Accomack Airport include Navy E-2 Hawkeyes, C-2 CODs and MH-60 Knighthawks. It has one asphalt runway, 03/21, at 5,000 x 100 feet, has 25 based aircraft, has 14,000 air ops per year and 38 per day... of which yearly 84% are GA, 8% are air taxi and 9% are military. 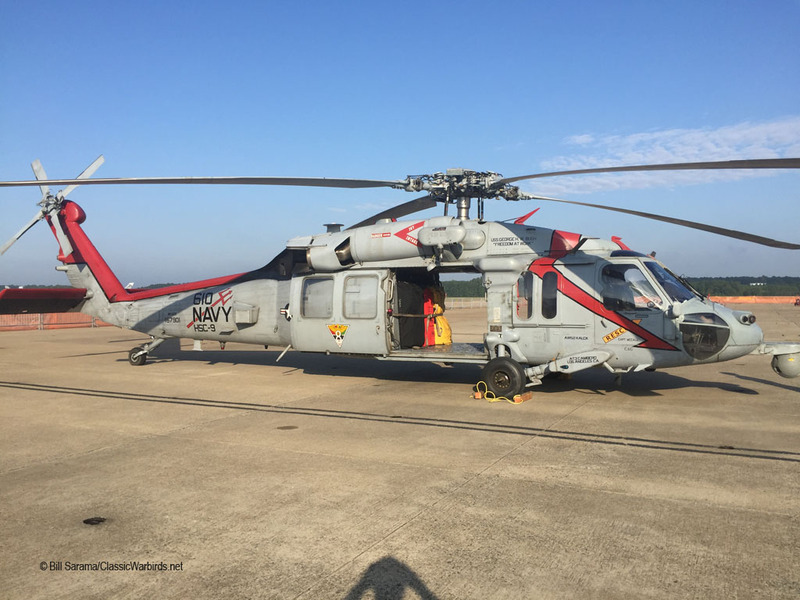 The occasional military operations include scheduled MH-53E Sea Dragons and MH-60S Knighthawk helos out of NAS Chambers Field in Norfolk and E-2C Hawkeye and C-2A COD Greyhound practice flights also out of Chambers. Usually most of the fixed wing Field Carrier Landing Practice (FCLP) for Carrier Qualification (CQ) training is conducted at the nearby NASA Wallops Island Flight Facility (WFF) where Landing Signal Officers (LSO) and a painted practice carrier deck are available for graded scheduled practice "Traps". However, if you hit it right at Accomack, you might get to see occasional fixed wing "Touch and Go's" besides occasional heavy helo practice operations. Accomack Airport was built by the United States Army Air Force in 1942 and was then known as the "Melfa Flight Strip". It was an emergency landing airfield for military aircraft on training flights. It was closed after WW2 and was turned over for local government use by the War Asset Administration. KMFV has a new asphalt runway in excellent condition and a brand new well-designed high-ceilinged terminal building resembling the shingled USCG Life Boat Stations that were so prevalent along the Eastern Shore in the early 1900's. 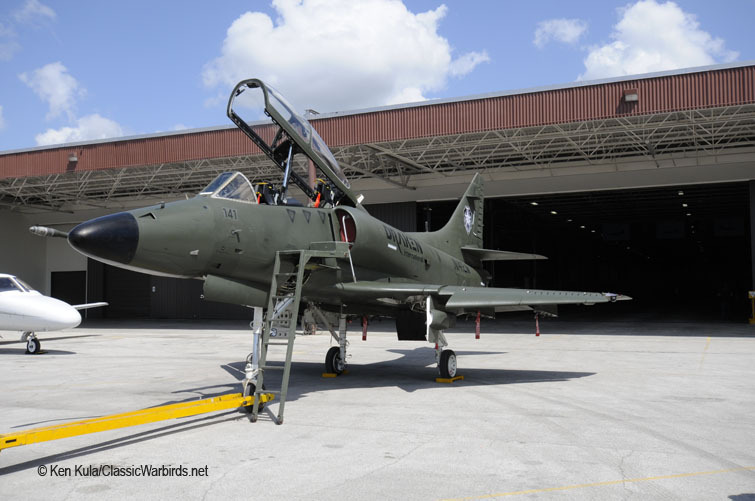 Tucked away, far from public view, sitting on the grass next to the new Terminal Building, sits an old Navy Warrior; a McDonnell Douglas A-4F Skyhawk, BuNo 155036, in its original low-viz tactical grey camo paint scheme. This A-4F is from VFC-12 "Fighting Omar's" based down the street at NAS Oceana. Its Construction Number MSN is 13852, its Code Number is AF-00, it has an "AF" on the tail, "00" on the nose, a "VFC-12" Squadron Ident on the rear fuselage, an "Omars" logo on the tail and now basks in its original dull gray war paint on the Airport grass. 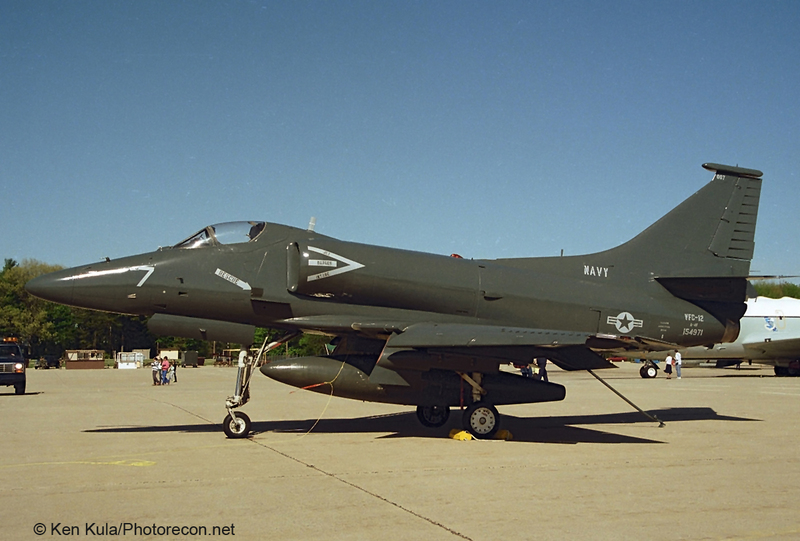 Surprisingly, some of the A-4 Aggressors with VFC-12 down in Oceana in the late 80's, when this same bird resided down in Virginia Beach, were not all done up in Soviet camo to look like Mig-17's or Mig-21's. Some retained their original low-viz gray camo like this one on display at Accomack. The A-4 Skyhawk was developed in the early 1950"s by the Douglas Aircraft Corporation as a light weight, single seat, single engine, attack fighter. Outstanding low speed control and stability during both take-off and landing made the Skyhawk ideal for carrier operations. Pound for pound, she is easily one of the most effective and versatile light attack planes ever produced. A single-seat high performance design with a 33 degree swept back wings with a dry weight of only 10,465 pounds earned her the nickname of "Heinemann's Hot Rod" named after the Douglas chief design engineer Ed Heinemann. Between 1953 and 2003, McDonnell Douglas produced 2,960 units of various A-4 models. All of the models had two internally mounted Mk 12 20mm cannons and were capable of delivering both conventional and nuclear weapons both day and night with a maximum ordinance load of 9,900 pounds. Aggressor VFC-12 Skyhawk in the late 1980s. Its maximum speed of 673 mph, tight turning radius, high rate of climb, high-G performance and small airframe profile made the A-4 ideal to imitate Soviet adversary aircraft with high performance ACM fighter tactics. The A-4 was retired from the USMC in 1998, from the USN in 2003 and from the Israeli Air Force as recently as 2015. But this old bird does not want to totally retire. Top to Bottom: Draken TA-4K and A-4L Skyhawks. 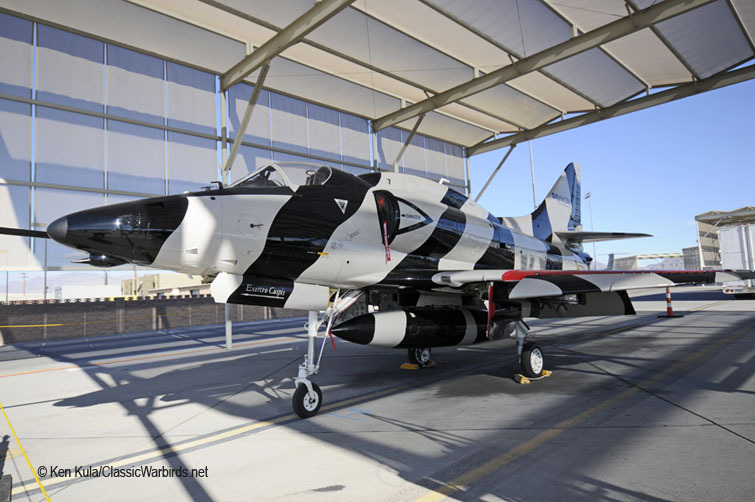 Currently there are some private Aggressor Contractors that use their privately owned Skyhawks to this day for Dissimilar Air Combat Training (DACT) with the US Military. Such private Aggressors that are currently flying A-4F Skyhawks (similar to the Accomack A-4F) include: a) "Draken International" - owns and operates eight former New Zealand A-4K Skyhawks and three A-4L Skyhawks as an Adversary Squadron; b) "AeroGroup"- a private commercial company that recently owned A-4 Aggressor aircraft; c) "A-4L, LLC" - Owns seven A-4's and currently operates three A-4L's (A4D-2N) Skyhawks based at KGYI North Texas Regional Airport / Perrin Field in Denison Texas (the old Perrin Air Force Base, an F-102 and F-106 training base, that closed in 1971). 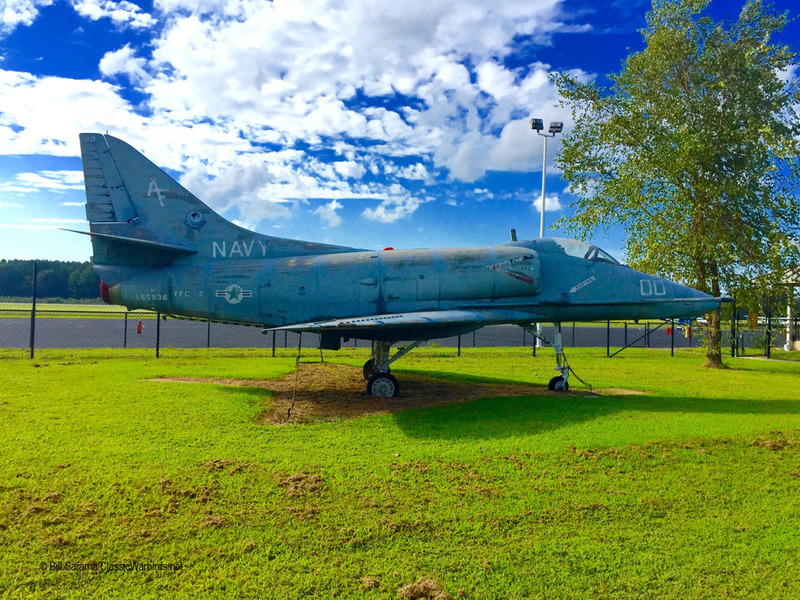 This particular A-4F Skyhawk (155036) on display here on the grass at Accomack Airport in DelMarVa Virginia had a colorful history with the US Navy and even the US Marine Corps. It started with its very first assignment in 1968 with VA-125 "Rough Riders" out of Lemoore, CA; then later in 1968 with VA-55 "War Horses" also at Lemoore; then in 1973 with Marine Squadron VMA-223 "Bull Dogs" working out of MCAS El Toro; then later in 1973 with a Marine Attack Squadron VMAT out of MCAS Yuma AZ; then 1975 to 1978 with VC-7 "Tallyhoers", an early aggressor squadron working out of Miramar with target towing and early dog fight training; then 1976 with VF-126 "Bandits" working out of Miramar as a Fleet Replacement Squadron and later becoming a West Coast Aggressor Squadron with the Soviet gray and blue camo with a big red number on the nose; then 1979 to 1984 with VC-7 again; then 1984 to 1992 with VF-126 at Miramar in a Top Gun Aggressor Squadron. 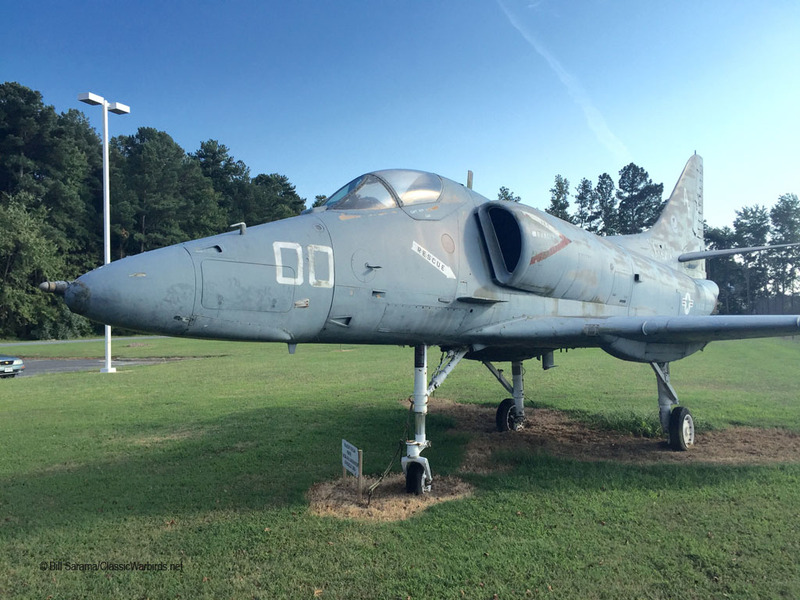 Finally 155036 ended its illustrious career by heading East to NAS Oceana to become part of their Aggressor Squadron VFC-12 "Fighting Omars" call sign "Ambush" from 1992 to 1994 when Accomack Airport acquired this Skyhawk as its famous Gate Guard. When 155036 was assigned to VF-126 "Bandits", it was part of the official "Pacific Fleet Adversary Squadron" working out of Miramar with the Top Gun Schoolhouse from 1984 to 1992 as a Top Gun "Mongoose" at Miramar. The "Mongoose" Skyhawks were special because they lost their dorsal hump behind the canopy, the 20mm gun and the internal ammo store, and also lost the external wing hard-point stores, all for the sake of greater maneuverability in DACT dogfights. This weight and drag loss contributed to giving the F-14's a run for their money when picking a fight with 155036. Also, this same Skyhawk was at Miramar about the same time that the movie "TOP GUN" was being made at Miramar in 1985 and it is conceivable that this same A-4F just might have appeared in some of those ramp shots in the movie. 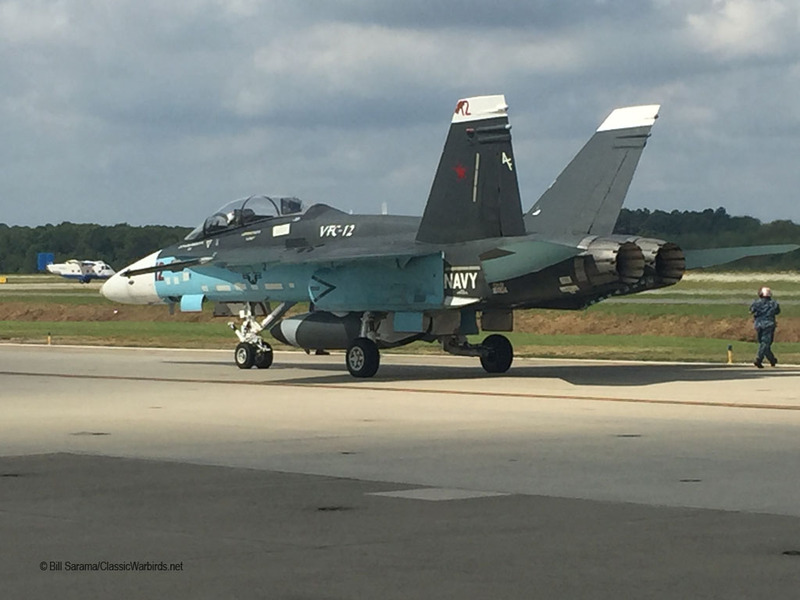 Fighter Squadron Composite 12 (VFC-12) was and still is a United States Navy Reserve Fighter Squadron now based at NAS Oceana in Virginia Beach, VA. 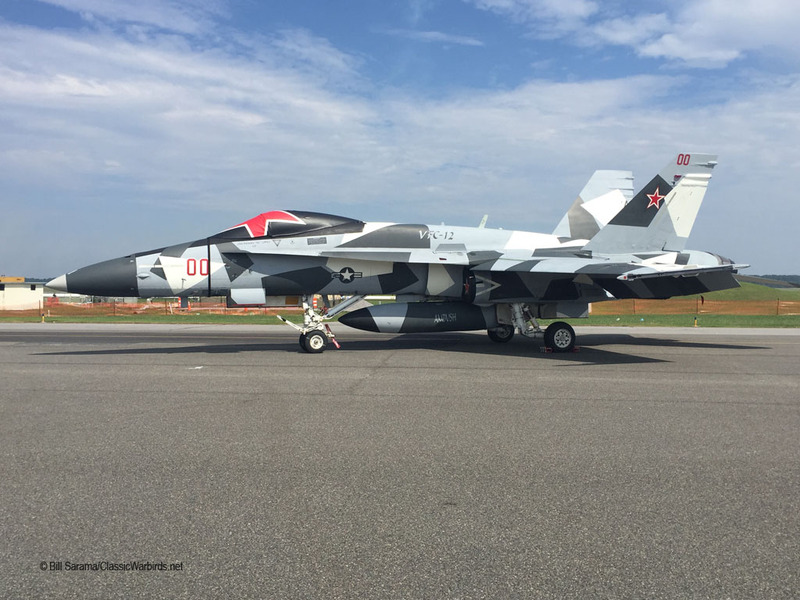 It continues to provide Adversary Training to East Coast air wings with their "Aggressor" aircraft with tactical paint schemes resembling potential enemy adversary aircraft. The "Fighting Omars" is manned by selected reservists, full time reservists (FTS) and active duty personnel. The Squadron's current call sign is "Ambush" and their tail code is still "AF" like the A-4F here at Accomack. 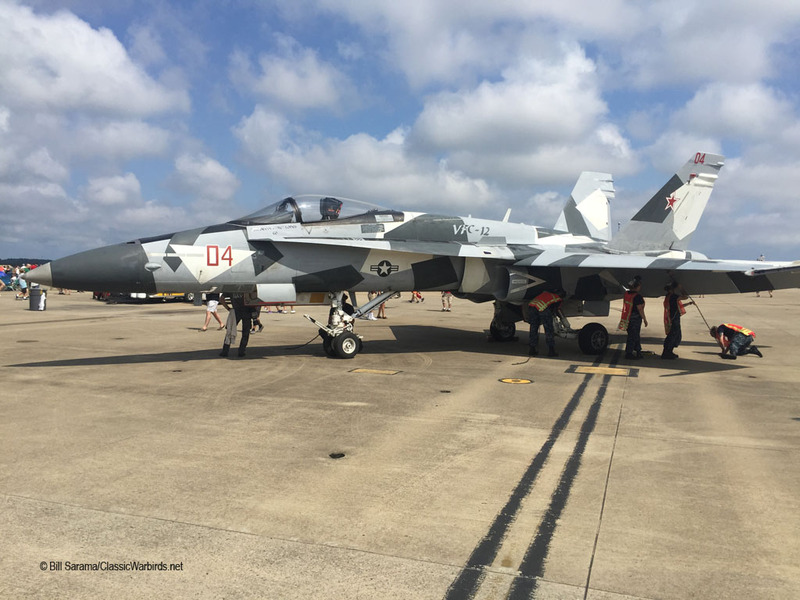 Their current Aggressor aircraft are F/A-18+ Hornets upgraded in 2012 with black, gray and white Prototype 2 Arctic Splinter camouflage (designed by USN veteran Darrall W. Taylor Jr.) to resemble the Russian SU-35 Flanker aircraft. Fighting Omar's F/A-18 Hornet at rest. The Squadron's primary mission continues to be to support the "Strike Fighter Advanced Readiness Program" (SFARP) which trains operational fleet F/A-18 squadrons. SFARP is an intense three-week training exercise conducted by the Strike Fighter Weapons School Atlantic that allows fleet "Strike Fighter" aircrews to hone their war fighting skills against a credible adversary prior to deploying. Yes, it is very similar to "Top Gun" previously held at NAS Miramar in San Diego (go see the movie TOP GUN one more time!) but now headquartered in NAS Fallon, Nevada. 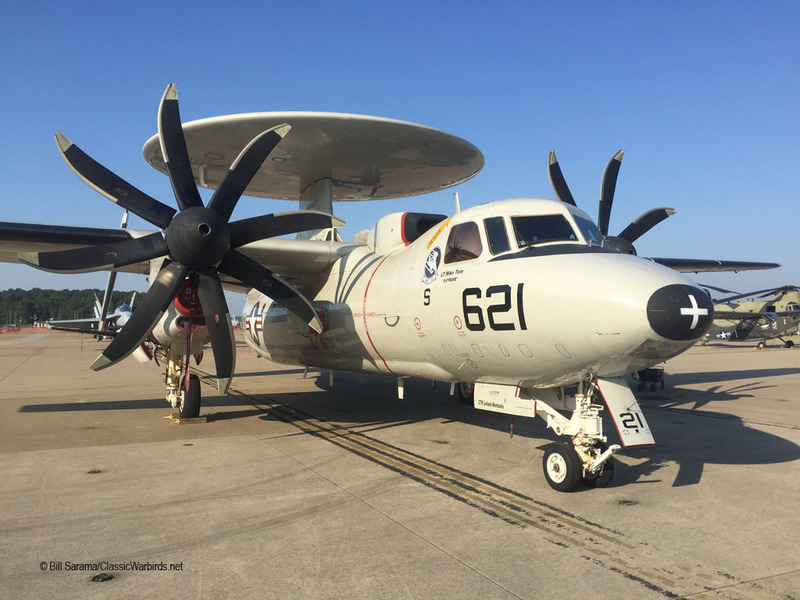 VFC-12 also supports the F/A-18 Fleet Replenishment Squadrons at NAS Oceana and also maintains an Aggressor Detachment working out of NAS Key West Florida. VFC-12 often averages more than 200 days a year on Det. Services. The VFC-12 A-4F Aggressor Skyhawk Gate Guard (155036) on display near the terminal here at Accomack Airport Virginia, came to the Eastern Shore in three sections in 1995 from her last duty station at NAS Oceana in nearby Virginia Beach, VA. She is officially "On Loan" from the National Museum of Naval Aviation located in Pensacola Florida. In September of 1993, Mr. Dan Williams of Altair Aviation, previously located here at the Accomack Airport, presented a proposal to the Airport Commission to obtain a surplus military aircraft which they would maintain for display purposes at the Melfa Airport. 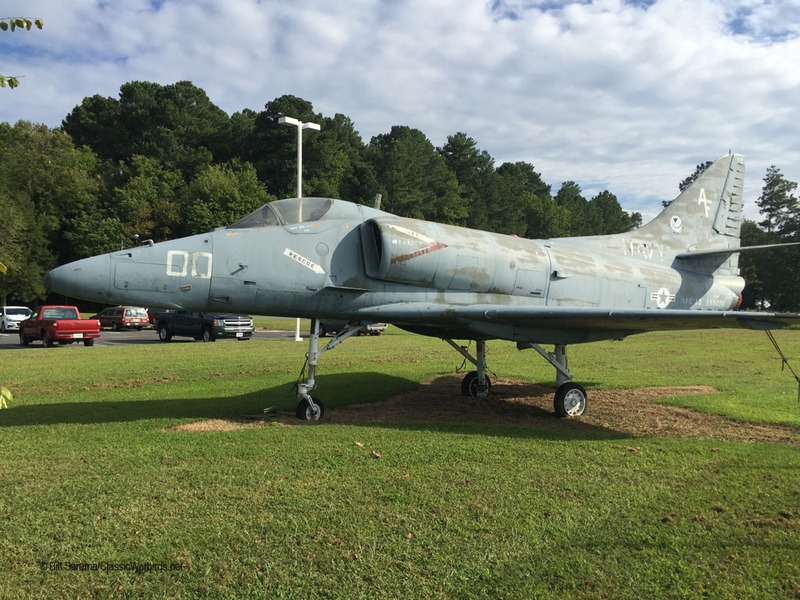 In 1993, Williams had made the contact and arrangements for a surplus A-4F Skyhawk, but a formal request was needed from Accomack County. In June 1994, the Airport Commission passed a motion requesting permission to acquire the A-4 for display at Accomack County Airport with the proviso that Altair would assume the maintenance and hanger the aircraft "between showings". There never was a formal "Memorandum of Understanding" (MOU) with Altair and the County regarding responsibility for the aircraft's upkeep and storage. In March of 1995, Altair transported the aircraft in three sections from NAS Oceana to their original company hanger located in Melfa, VA, where it was re-assembled and stored. Piedmont Aviation acquired Altair in September of 1995. In November of 1995, the old Airport Commission made a formal request to the Industrial Development Authority (IDA) to display the A-4F at the entrance the Industrial Park near the Airport. Piedmont Aviation offered to build a concrete pedestal and walkway for public viewing of the aircraft. The IDA lost no time in approving the offer. However, Piedmont Aviation left the County shortly thereafter and that plan never materialized. At this point in 1996 a location for display near the new Terminal Building was chosen and the A-4F still sits to this day on the grass for over 20 years (!) patiently waiting for someone to build a pedestal over by Route 13 for her final resting place! The Airport's promotional literature notes that to complete this proposed "A-4 Mission", they need to accomplish three goals: (1) They must upgrade the physical condition of the aircraft. This is the first priority and is required by their contract with the US Navy. They should be able to do all the work required at the plane's current location near the Terminal. 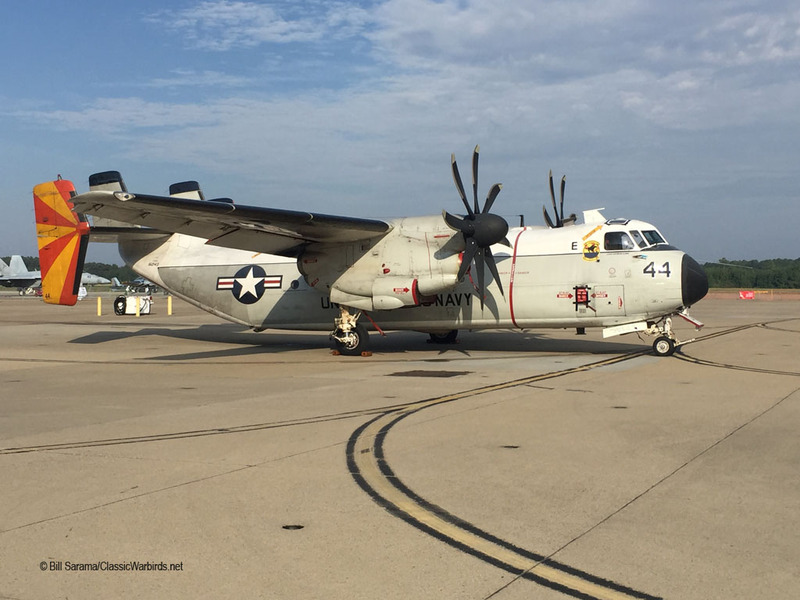 Plus, the Airport Commission has suggested that some active duty aircraft maintenance personnel from the Navy at Oceana could come out and actually help restore this aircraft while the Airport could provide volunteers to work alongside. (2) After this restoration, the aircraft needs to be moved to a site at the main entrance to the Industrial Park and the Airport near the corner at US-13. The Airport feels that a new location just 1/2 mile from where she now sits "will allow the thousands of travelers on US Route 13 a chance to get a view of our hidden gem". "What better indication that there is a real airport here than seeing an eye-catching restored military fighter jet come out of the shadows and now be on proud public display" as noted in the Airport promotional brochure. (3) Build the "Final Display" for the aircraft. 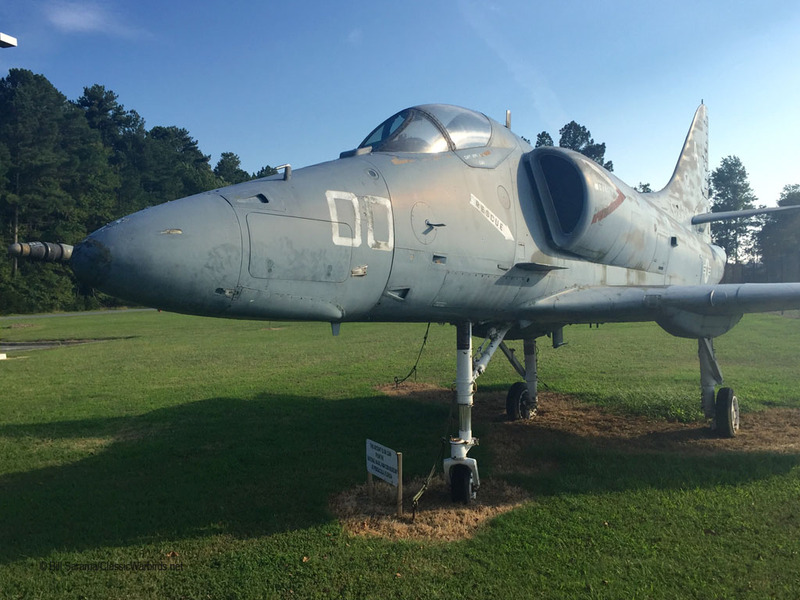 The Airport said the concept was to mount the A-4 on a concrete pedestal and locate the display at the entrance to the Industrial Park at the intersection of US-13, not far from the Airport. The land is available and at no cost. The most difficult part for the Airport Commission is the need to properly engineer the concrete support for the mounting of the plane. I personally feel that the A-4 should NOT be on a high pedestal but rather should be on ground level as you would see the plane on a concrete ramp. Also, great care should be taken in the repainting of the plane. We are all aware of a few restorations that incorrectly restore the aircraft. I for one appreciate the original low-viz gray color scheme that the aircraft arrived with as a true indication of actual operational tactical colors. Another option is the blue and gray camo scheme that other A-4F Aggressors were painted in at Oceana in the late 1980's We certainly wish the Accomack Airport Commission good luck in achieving their goal of properly displaying this A-4F Skyhawk out on the corner of US Route 13 so that all of us can one day see it as we go truck'n on down 13 to get to the Air Shows at Langley AFB or NAS Oceana!! !